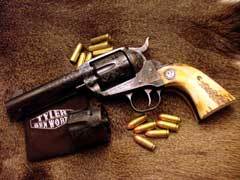 Five-shot groups, fired from a rested position at ten yards, show that the Tyler Gun Works Vaquero 357 Magnum / 9mm convertible is not only inherently accurate, but shoots close to point of aim using various loads. 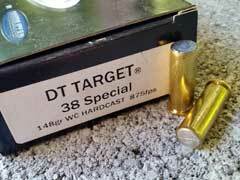 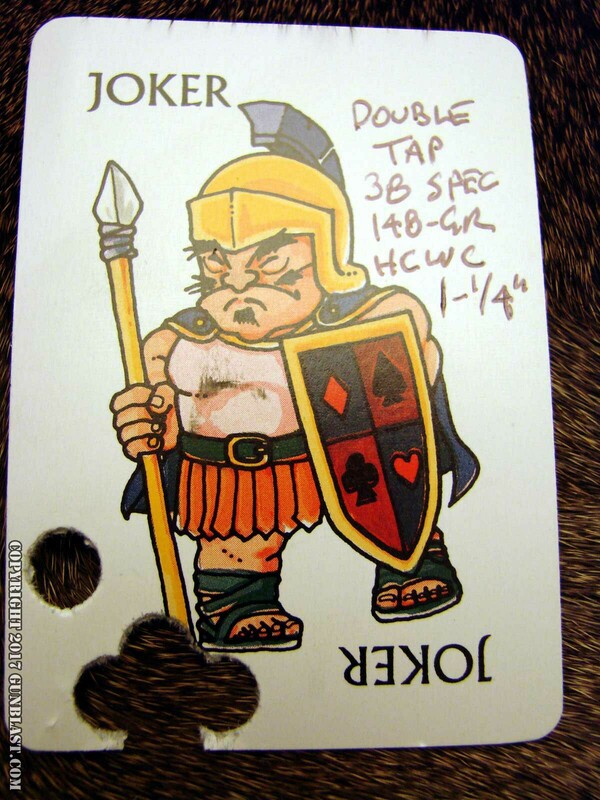 Boge's favorite 38 Special load, the Double Tap Target 148-Grain Hard-Cast Full Wadcutter, has proven to be superbly accurate in many of his favorite sixguns. Excellent Barranti Leather holster is made specifically for the Tyler Vaquero, and is available for a specially-discounted price from Tyler Gun Works. Bobby Tyler of Tyler Gun Works in Friona, TX, has until recently been one of the best-kept secrets in the firearms industry. He has created a great business for himself by doing what few can do, and doing it at very competitive prices. Bobby is among the best in the industry at metal finishing, and he has not only captured the traditional processes of bluing and color-casehardening, but he has created innovative new processes such as the ability to color-caseharden stainless steel, which had been considered an impossibility before Bobby figured it out. 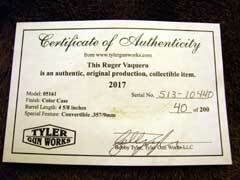 Bobby Tyler is a craftsman, an artist, and a scientist. Plus, he is an all-around great guy. Bobby has kept himself quite busy, has built-up his shop to the point where has several craftsmen working for him, and has created quite a name for himself, by finishing guns for large and small gun makers, and for custom gunsmiths around the country; but Tyler Gun Works has more recently been doing custom work directly for individual gun owners. 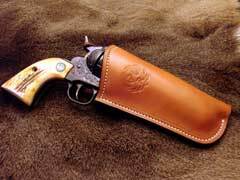 Earlier this year, Bobby offered a very special limited run of 200 sixguns, based on the Lipsey's-Exclusive Ruger Blued Bearcat Shopkeeper. 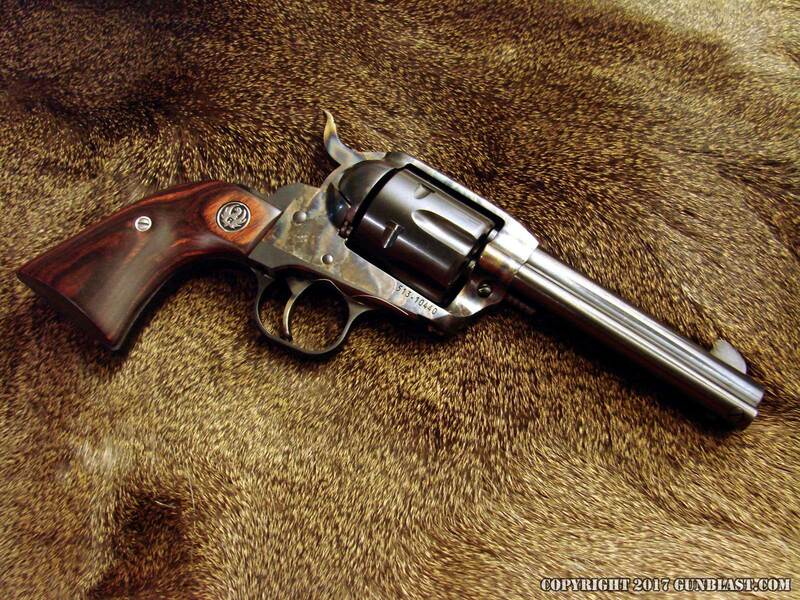 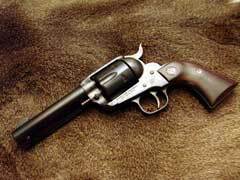 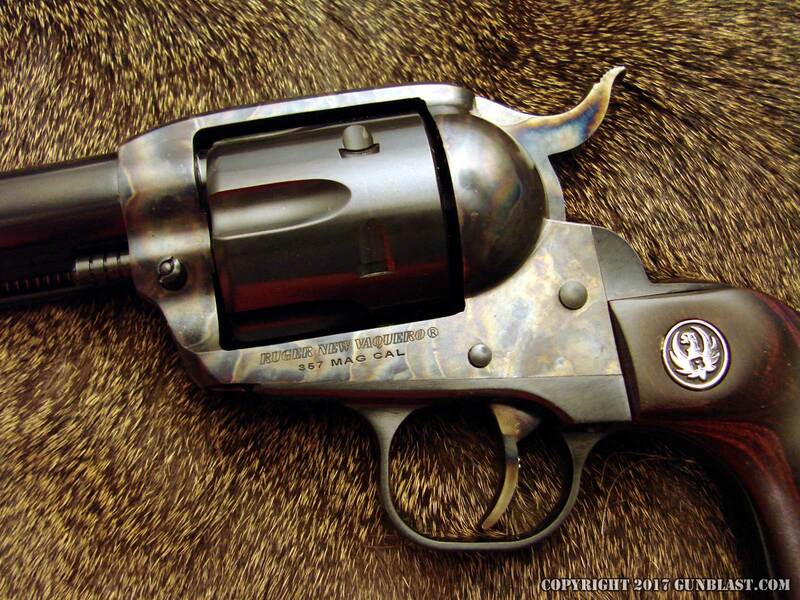 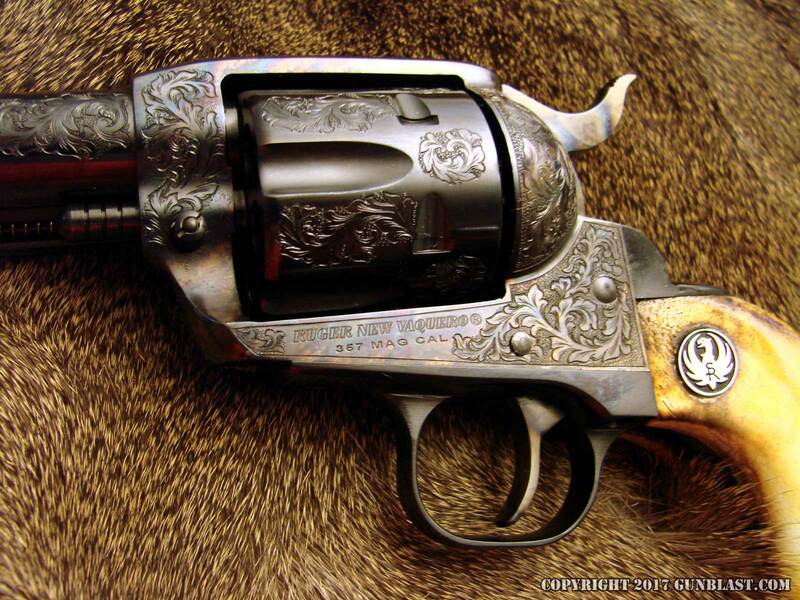 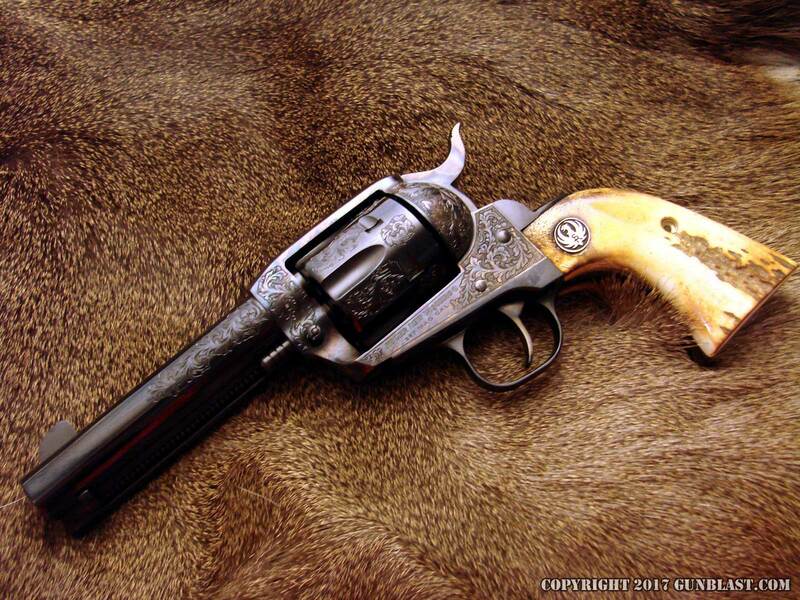 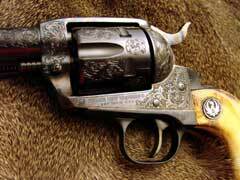 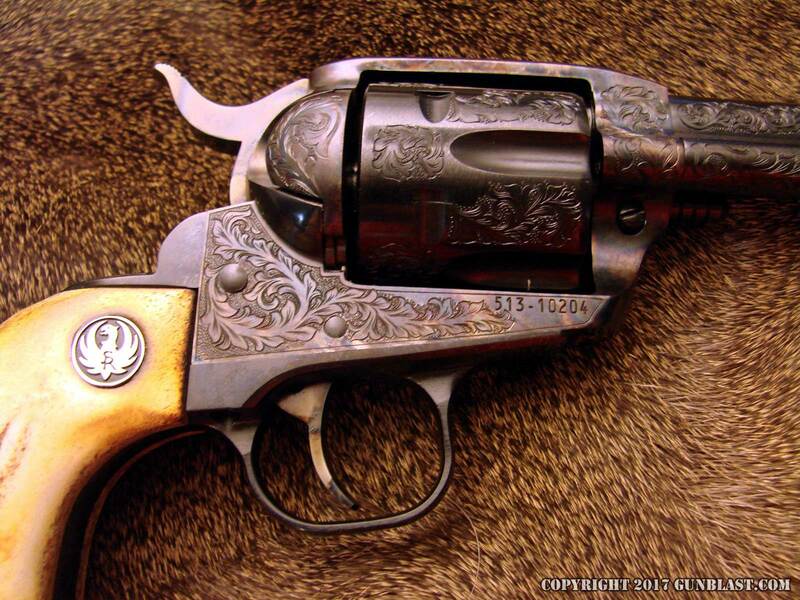 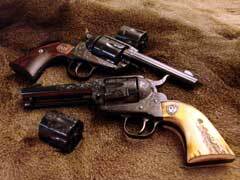 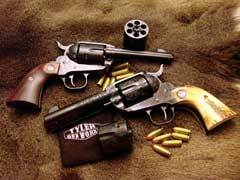 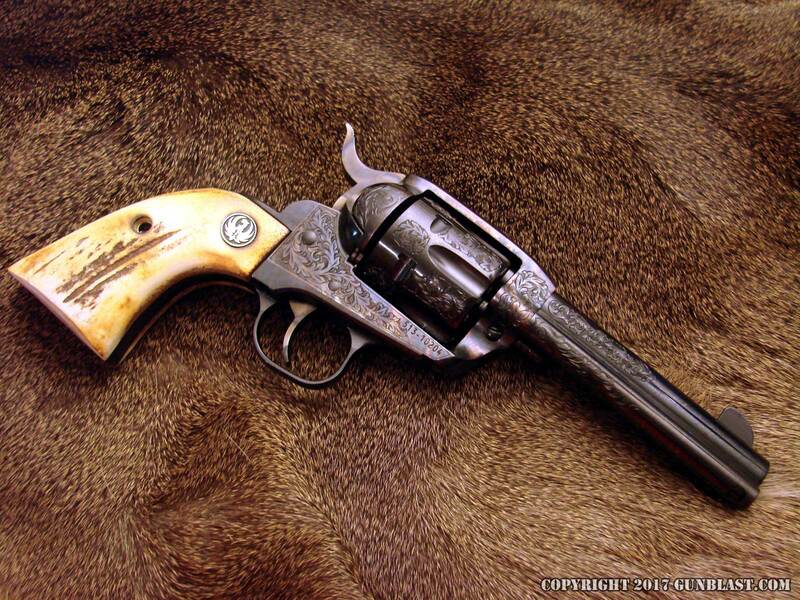 These Shopkeeper 22-caliber sixguns were available either with a color-casehardened frame, hammer, and trigger; or, in addition to the color-casehardening, with full hand-engraving and/or American Elk stag grips. 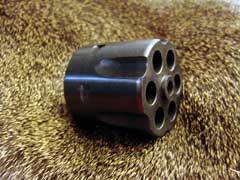 This limited run of 200 Bearcat Shopkeepers sold out quickly, and rightfully so, as they represented a great value in a collectible sixgun. 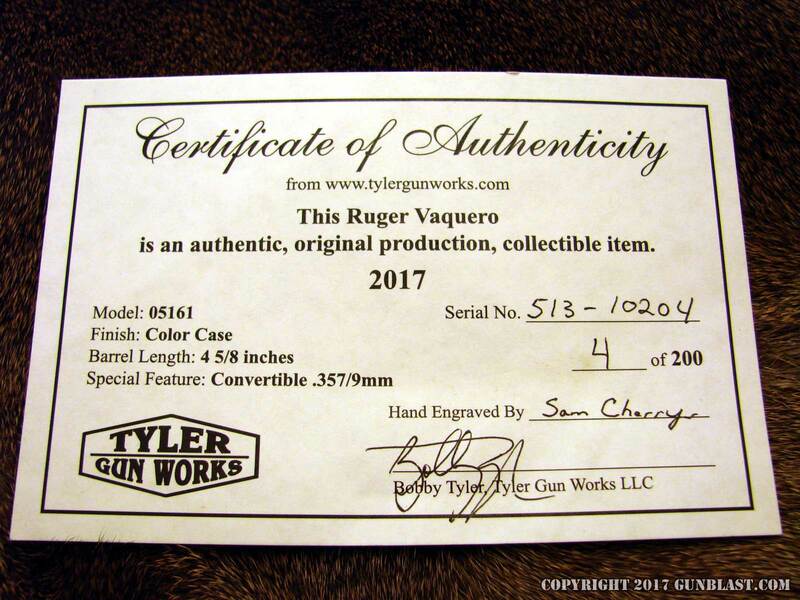 Now, Tyler Gun Works has followed-up on the success of the Bearcat Shopkeeper by offering another limited run of 200 Lipsey's-Exclusive sixguns: this time, based on the Ruger Vaquero 357 Magnum / 9mm Convertible. 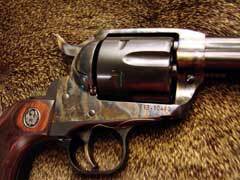 Bobby thought this would be a good opportunity to offer another great value package, this time on a very versatile centerfire sixgun. 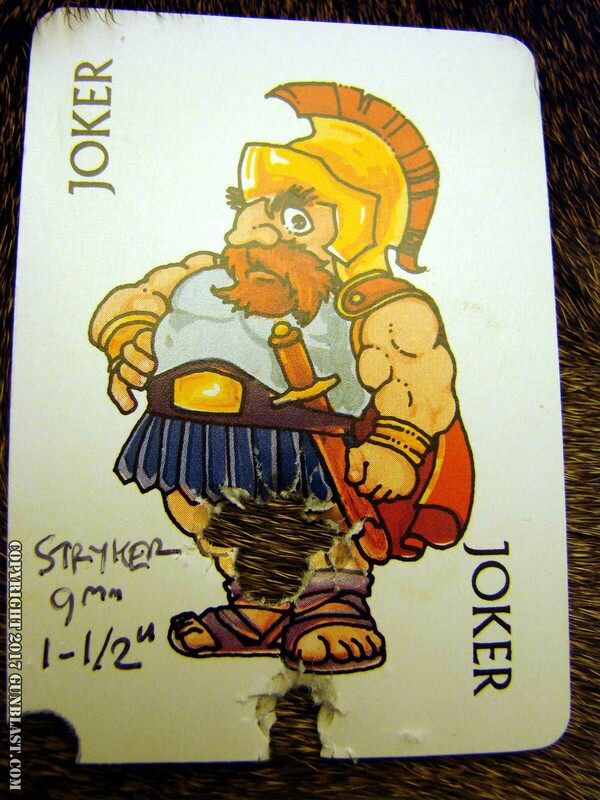 Was he ever right! 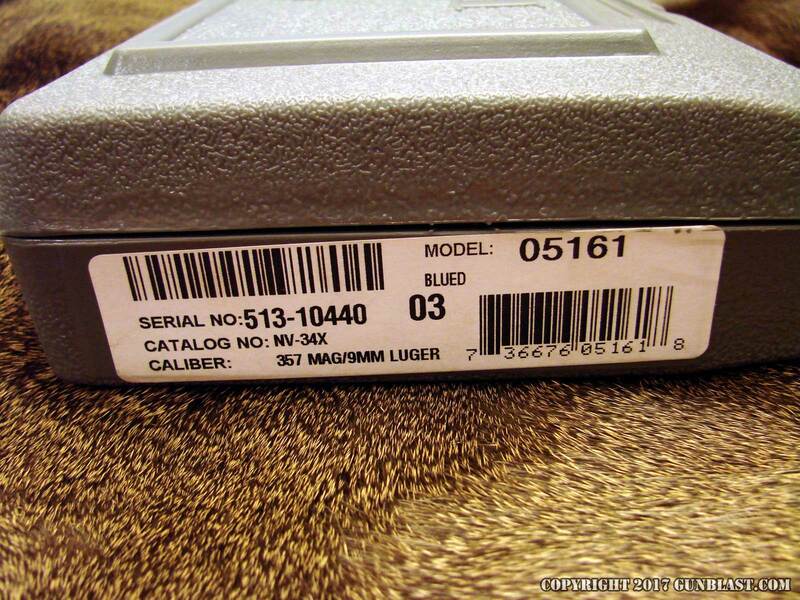 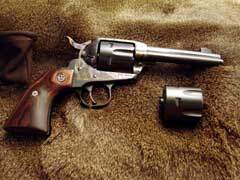 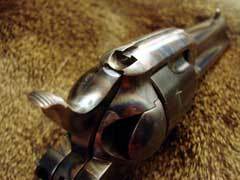 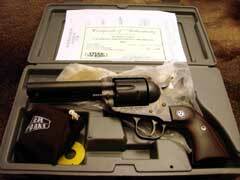 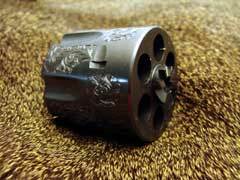 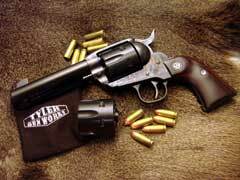 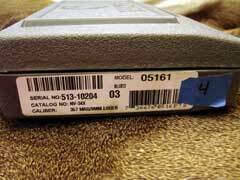 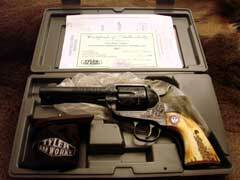 First, to begin with the base sixgun: the Ruger Vaquero has never before been offered as a 357 Magnum / 9mm Convertible. 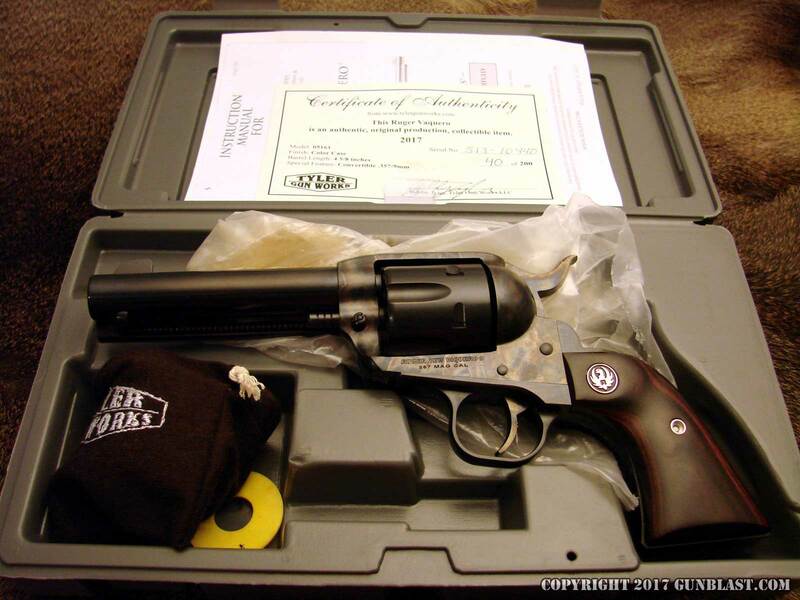 Ruger has made adjustable-sighted Blackhawk 357/9mm Convertibles for many years, but a fixed-sighted Ruger 357/9mm sixgun has been a purely custom proposition until recently, when Lipsey's distributors in Baton Rouge, LA persuaded Ruger to make the Vaquero 357/9mm as a Lipsey's Exclusive. Thus, the versatility of a fixed-sighted Ruger sixgun which could fire 357 Magnum or 38 Special as well as 9mm (using a second cylinder) finally became available for easy and economical purchase; please note that similar cases to the 9mm (also known as 9mm Luger, 9x19mm, or 9mm Parabellum), such as the 380 ACP or 9x18mm Makarov, will not work in these revolvers, as the cartridge headspaces on the case mouth. Enter Tyler Gun Works. 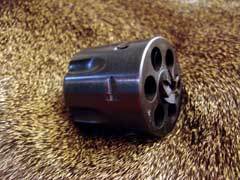 After the success of his Bearcat Shopkeepers, Bobby was looking for a way to offer shooters a similarly spectacular sixgun at a similarly economical price, and the Vaquero 357/9mm was a perfect fit. Bobby could obtain the Vaqueros from Lipsey's at a low enough price to be able to offer individual shooters a custom sixgun with a color-casehardened frame, hammer, and trigger for $850, which is $49 less than the base sixgun's MSRP of $899 from Lipsey's. Not only are the Tyler Gun Works Vaqueros beautifully finished, which is a definite cut above the original's all-blue finish with in-the-white stainless hammer and trigger, but are also lightly tuned. Bobby must completely disassemble the guns in order to finish them, and when he reassembles them after finishing, little details such as barrel/cylinder gap and internal parts fitting can readily be addressed; so, issues that cannot economically be corrected in a large factory setting, such as gritty triggers and excessively-large barrel/cylinder gaps, can be easily handled. This results in not only a more beautiful product, but a mechanically better one, all at a price that is still less than the base sixgun's MSRP. This represents a great value, of the kind that is seldom seen in today's market. For those who desire the BEST, and are able to spend a (surprisingly) little more money, Bobby is offering the option of having your Vaquero fully engraved. 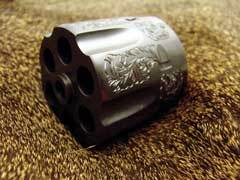 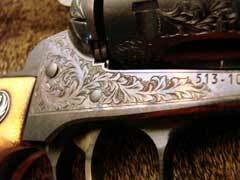 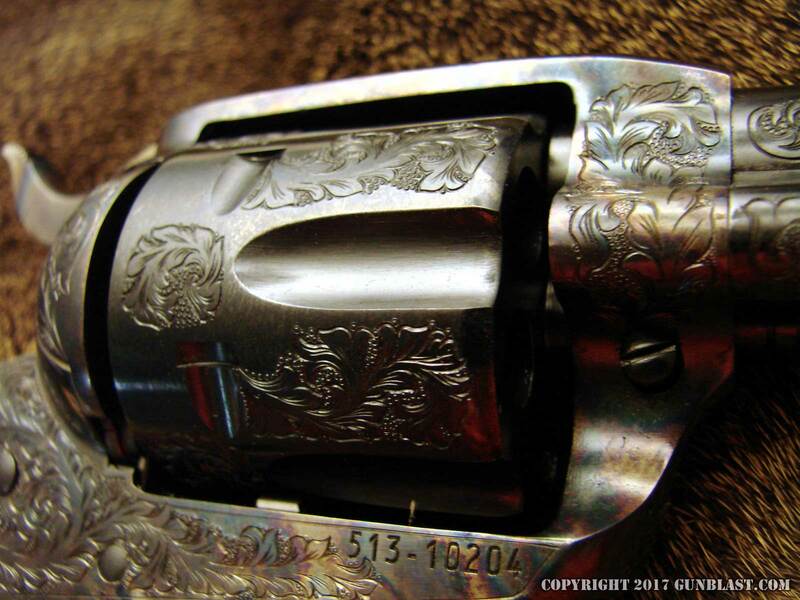 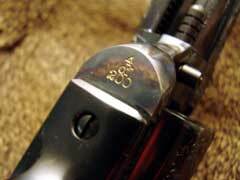 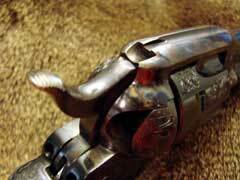 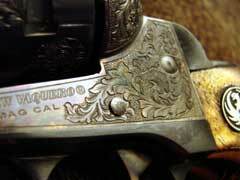 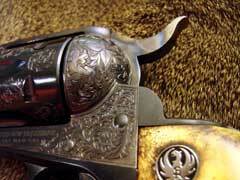 Bobby has contracted with an engraver out of North Carolina, who does an excellent job on these sixguns. 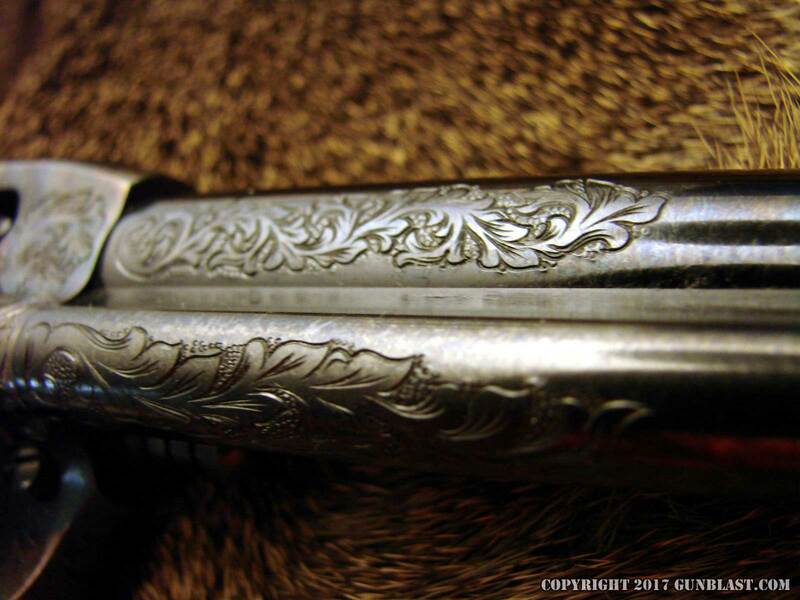 I am honored to have the first engraved example, #4 of 200, and it is stunning: the engraving is accomplished in a unique and beautiful style that combines traditional American scroll work with Italian leaf styling, and the result is everything I could have wished. 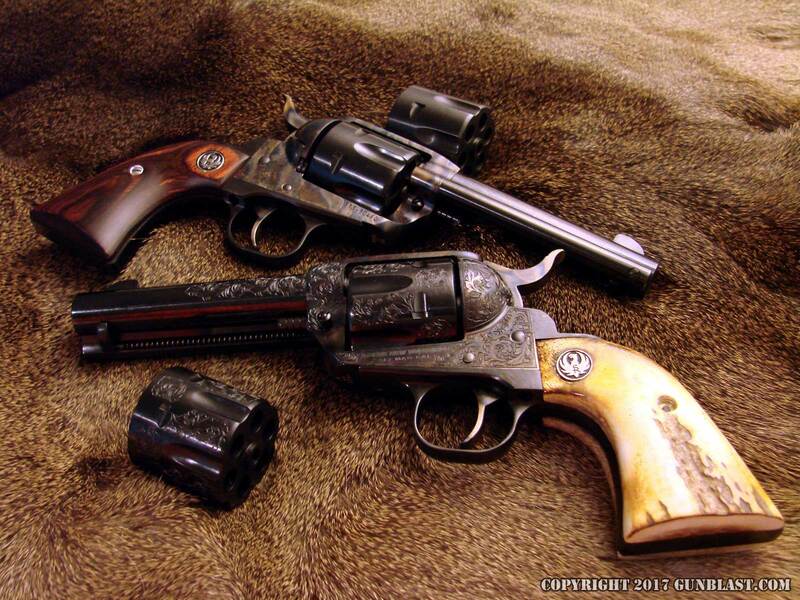 But I will let the pictures speak for themselves. 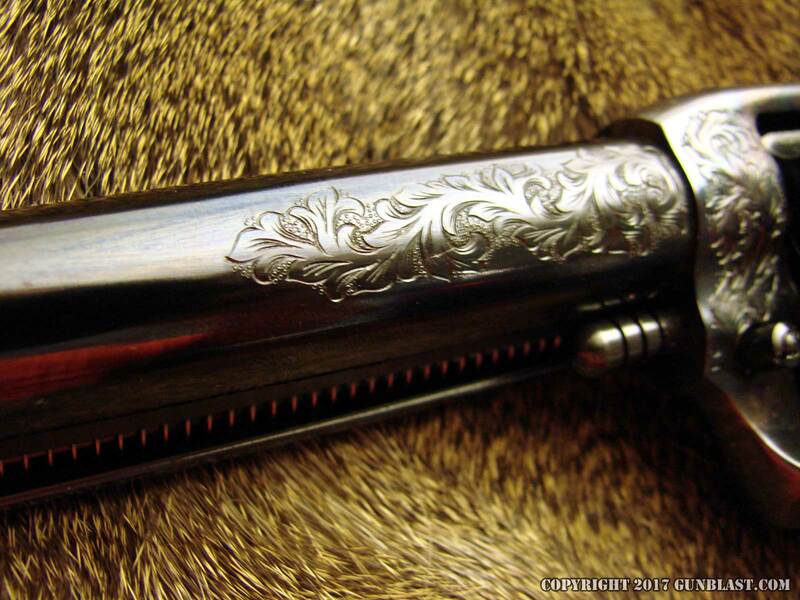 Notwithstanding the beauty of the metal finishing and the engraving, the most amazing thing about the engraving package is the price. 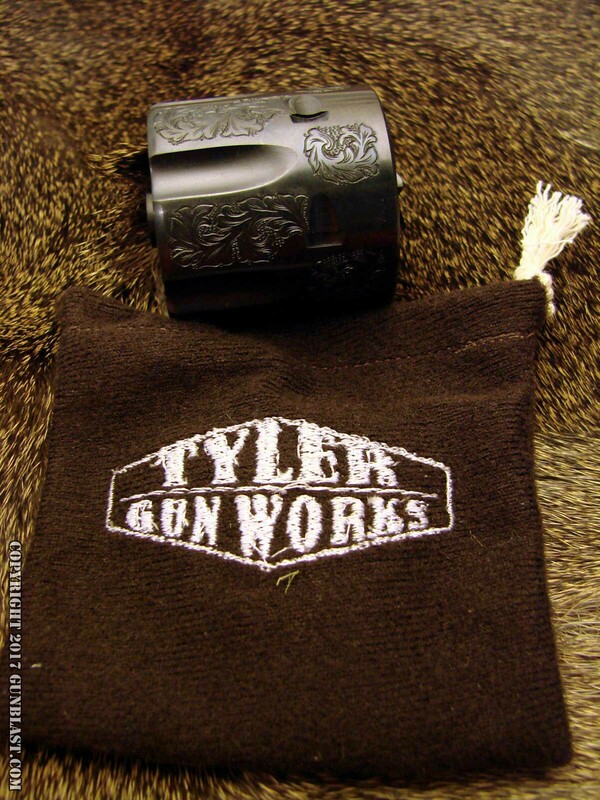 Not only is the sixgun fully-engraved, but the extra 9mm cylinder (which comes in a nice bag embroidered with the Tyler Gun Works logo - nice touch, Bobby!) 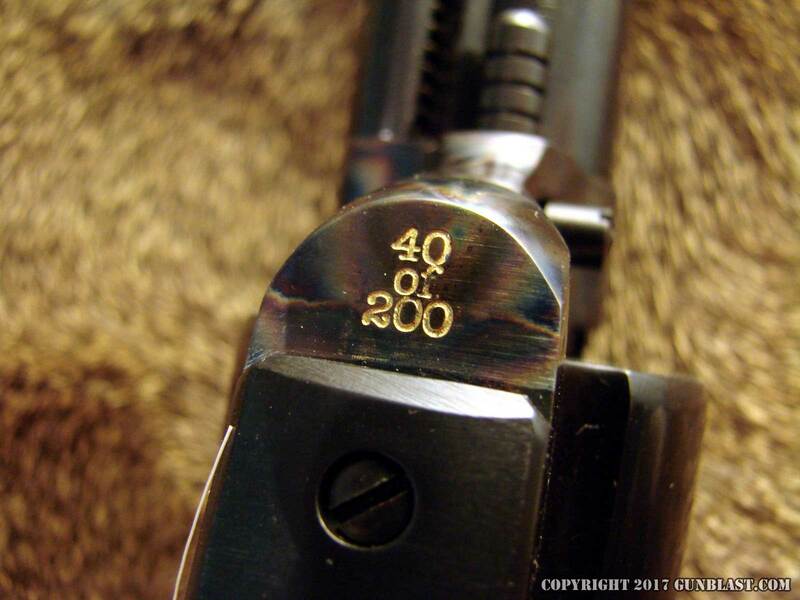 is also engraved, and all this for an additional $500. 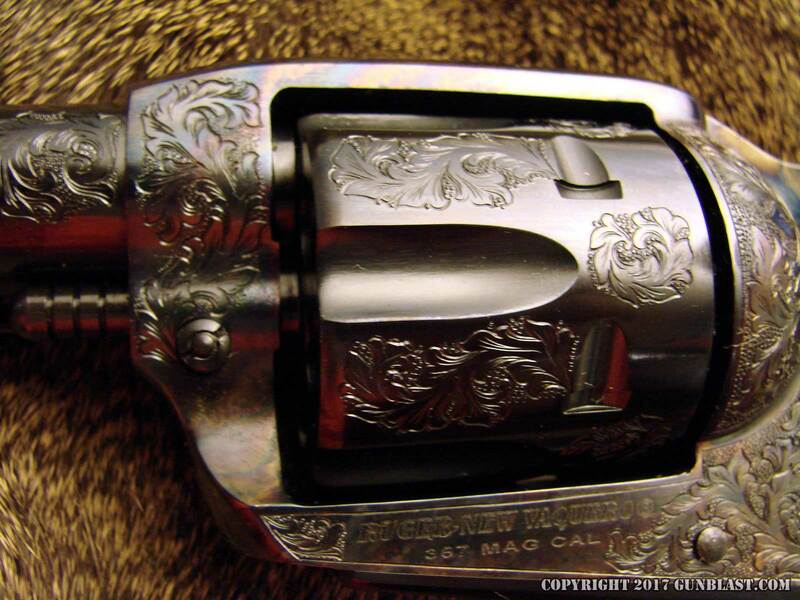 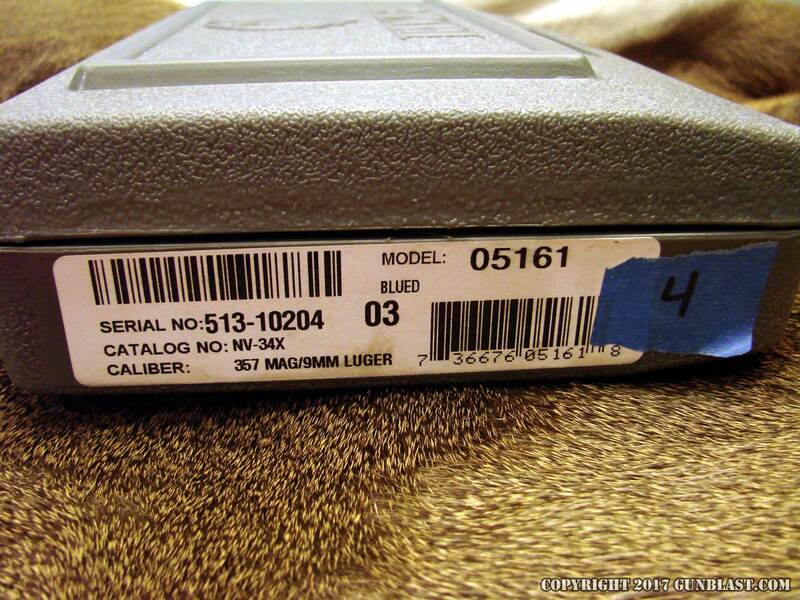 If any of you have ever had guns custom-engraved, as I have, then you will know that it is hard to find engraving of this coverage and quality for double the price of the Tyler Vaquero's engraving. 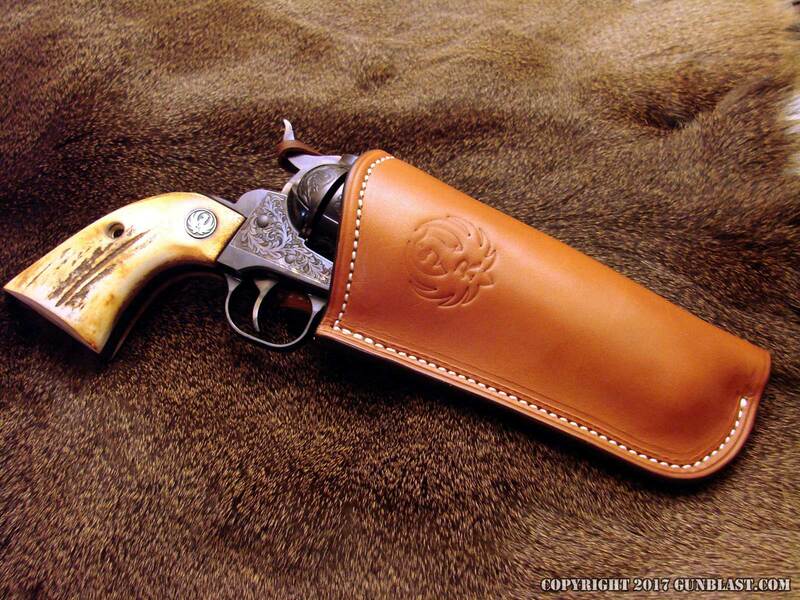 As an additional option, Bobby is offering a set of beautifully-executed Stag grips for these Vaqueros. These are very well fit and nicely antiqued by Tyler Gun Works, and add substantially to the overall visual impact of the sixgun: the antiquing makes the grips look like old Sambar Stag, wonderfully complementing the beautiful case colors of the sixgun. 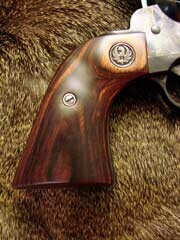 Again, the best aspect here is the price: where one would expect to pay upwards of $300 for grips of this quality, Bobby is offering these for only $170 extra. 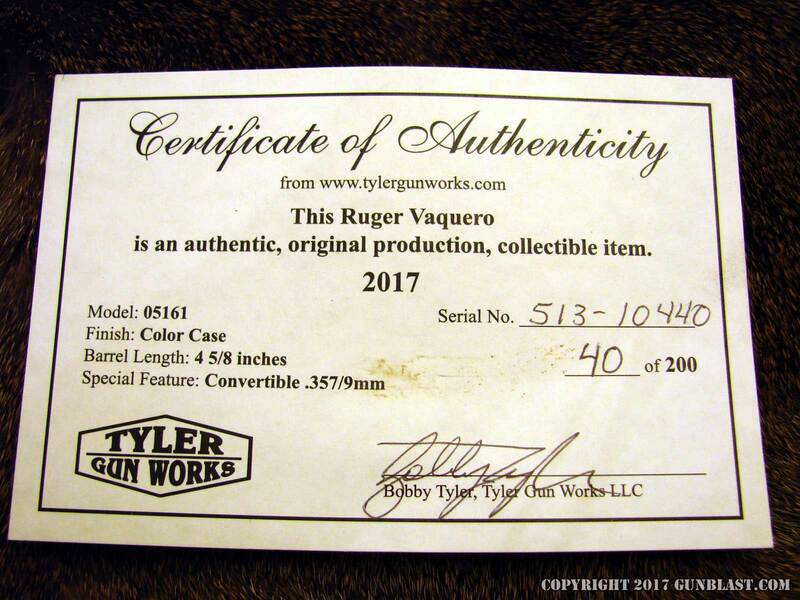 So, if one wanted to go all-out and get the fully-optioned Tyler Vaquero with engraving and Stag grips, the total price would be $1,520 US. 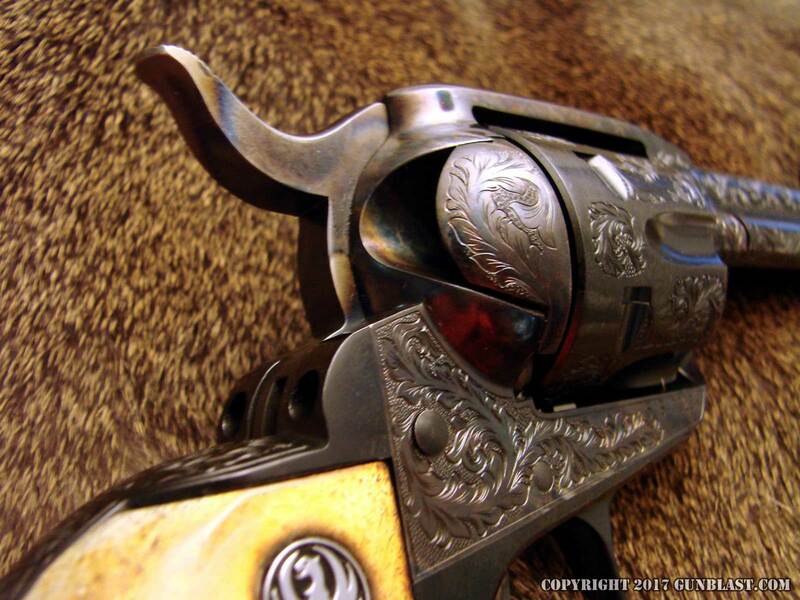 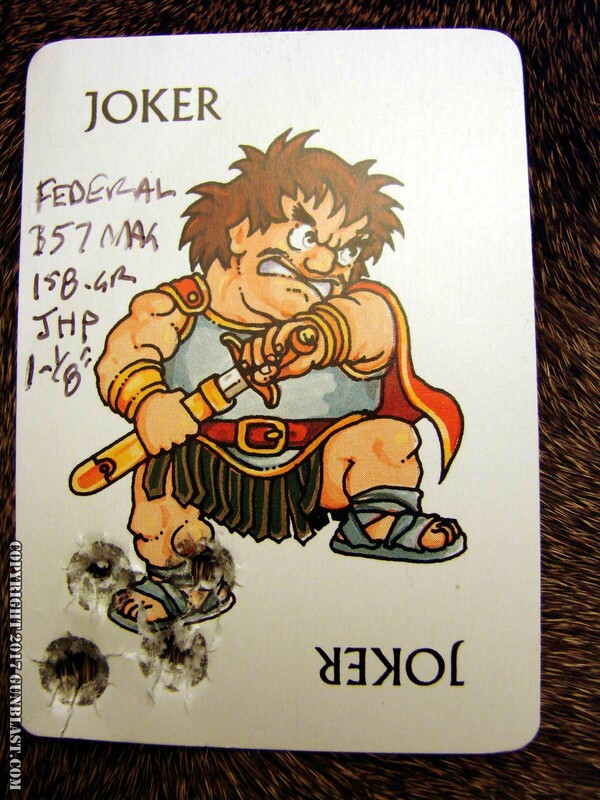 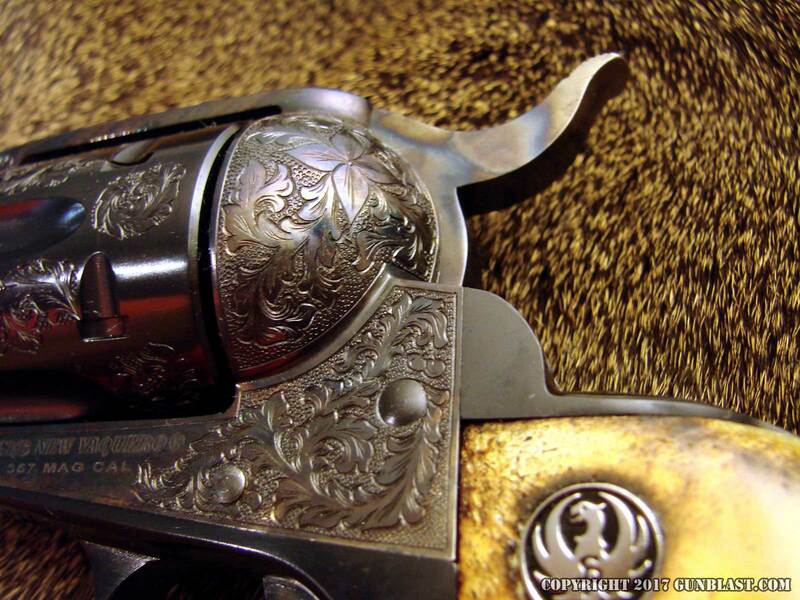 For an heirloom-quality sixgun such as this, which any shooter would love to hand down to future generations, fifteen hundred dollars represents an astounding value. 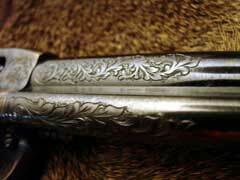 Speaking of heirlooms...I SHOOT mine. Guns are made to be enjoyed and used, not to languish behind a safe door, unloved, just so your kids can say they are unfired when they sell them after you crater. 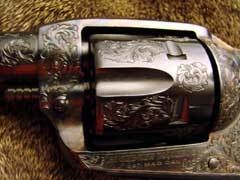 Look at it this way: what would your kids and grandkids prefer - a pristine Safe Queen, or Granddad's favorite old sixgun? 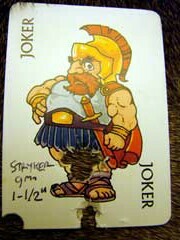 If the answer to this is the former, they don't deserve it anyway. 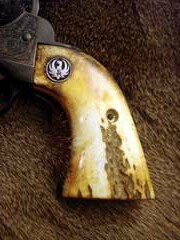 Take care of your guns by all means, but shoot them and enjoy them. 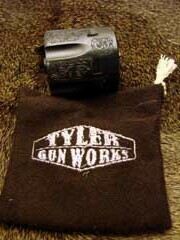 As a final option offered by Tyler Gun Works for these spectacular sixguns, a special holster can be ordered to complete the package. 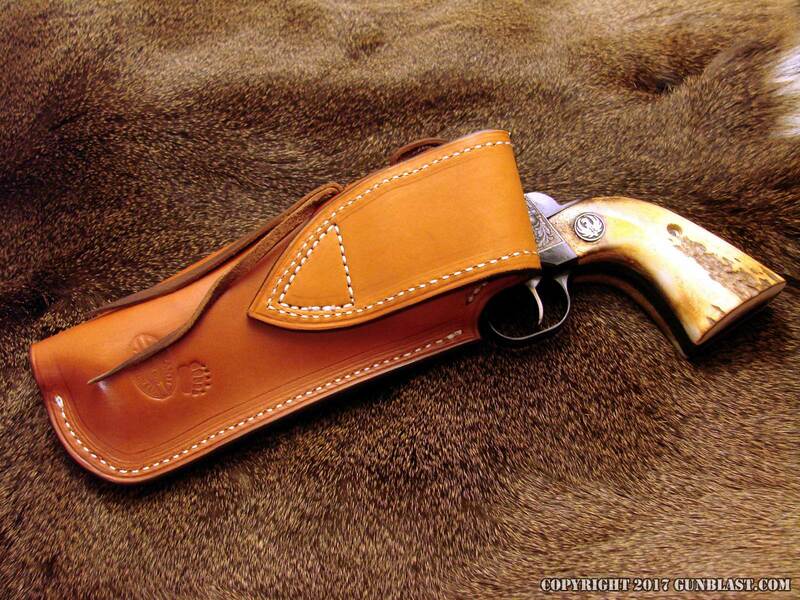 Made by Mike "Doc" Barranti of Barranti Leather, these holsters are wonderfully crafted lined holsters with a Ruger emblem on the front, and make a perfect companion to the Tyler Vaqueros. 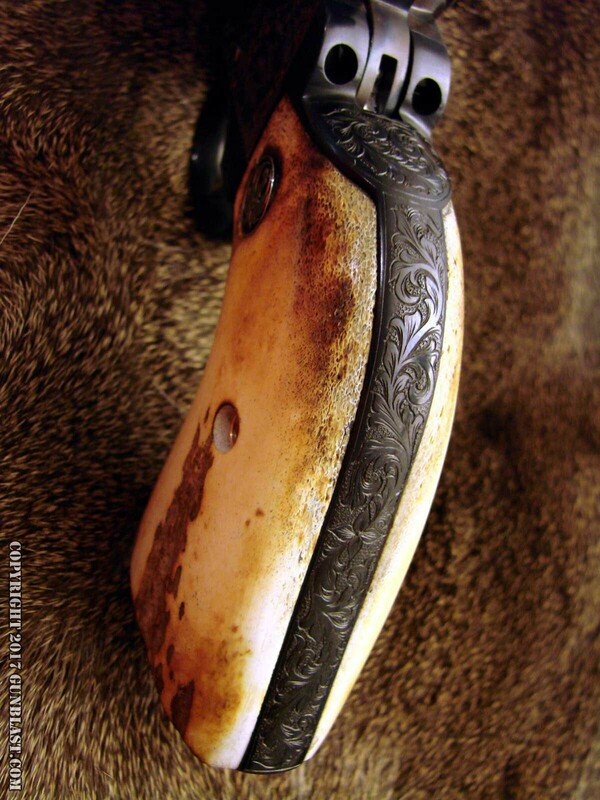 Mike Barranti is a true Artist in leather, and is among the finest holster makers this country has ever produced. 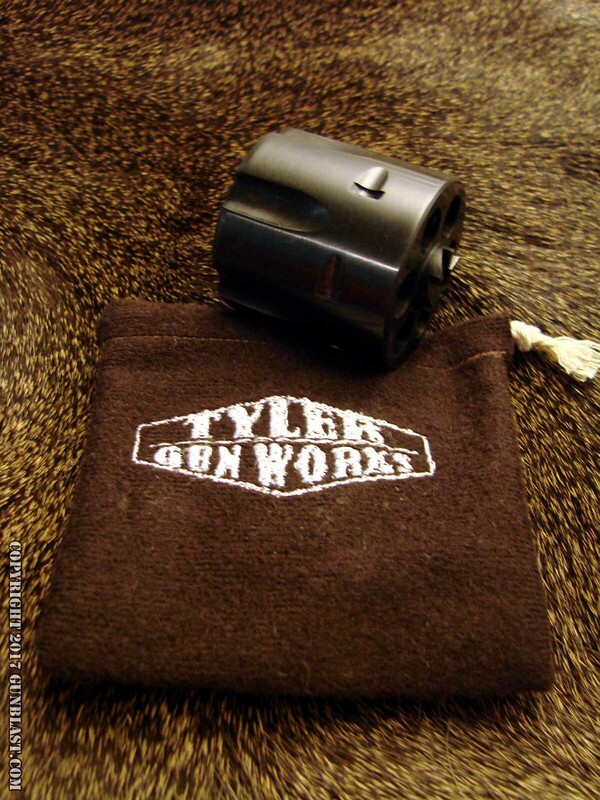 Mike's work is not cheap, but it is the best; Mike's normal price for a holster of this quality would be somewhere around two hundred dollars, but Mike is offering these through Tyler Gun Works for only $125 each. To get one of these holsters at this price, order from Tyler Gun Works along with the sixgun. I bought one for each of my Tyler Vaqueros, and I do not regret it. Bobby Tyler and Tyler Gun Works really knocked this one out of the park. 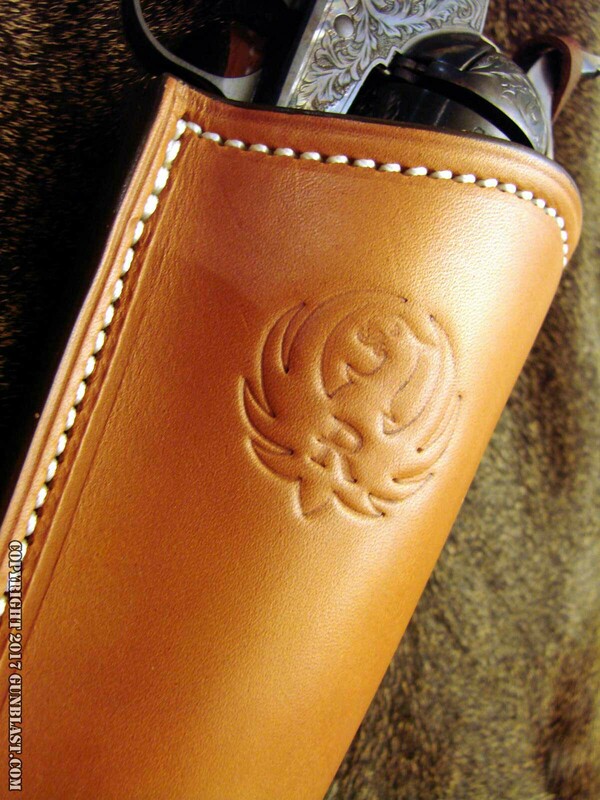 Only 200 of these will be produced, and at the time of this writing, there are only a very few remaining. 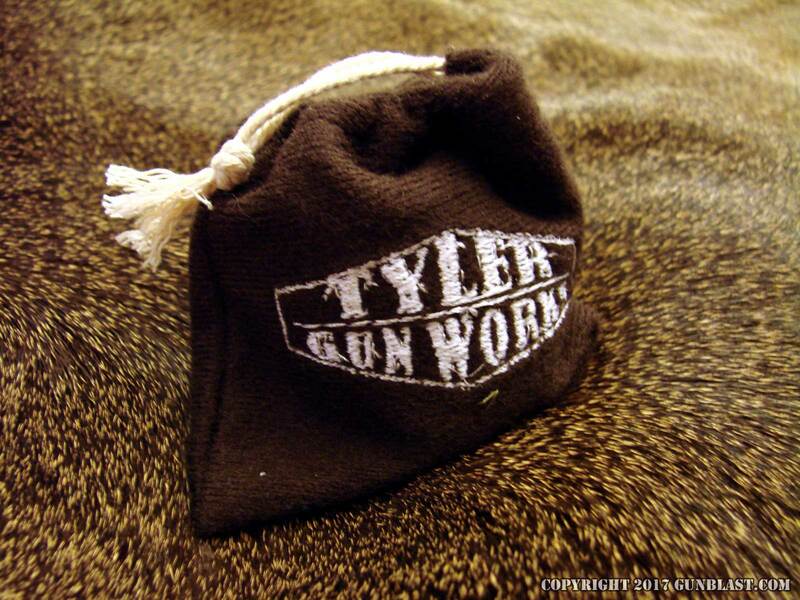 They will sell out quickly, so I highly recommend that you contact Bobby Tyler immediately to order yours. 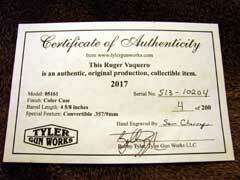 Order the Tyler Gun Works Limited Edition Ruger Vaquero 357 / 9mm Convertibles at www.tylergunworks.com. 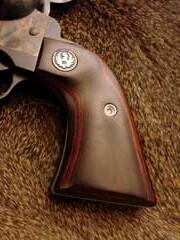 Check out the wide and diverse Ruger line at www.ruger.com. To order the standard Vaquero Convertible, or any number of other Lipsey's Exclusives from a dealer in your area, click on the DEALER FINDER at www.lipseys.com. 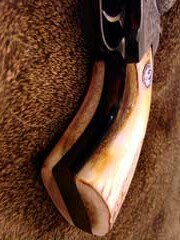 To buy the best ammo available, go to www.doubletapammo.com and www.buffalobore.com. 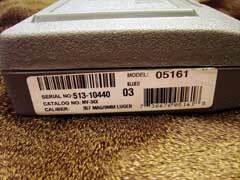 To buy 357 Magnum, 38 Special, and 9mm ammo online, go to www.midsouthshooterssupply.com and www.luckygunner.com. 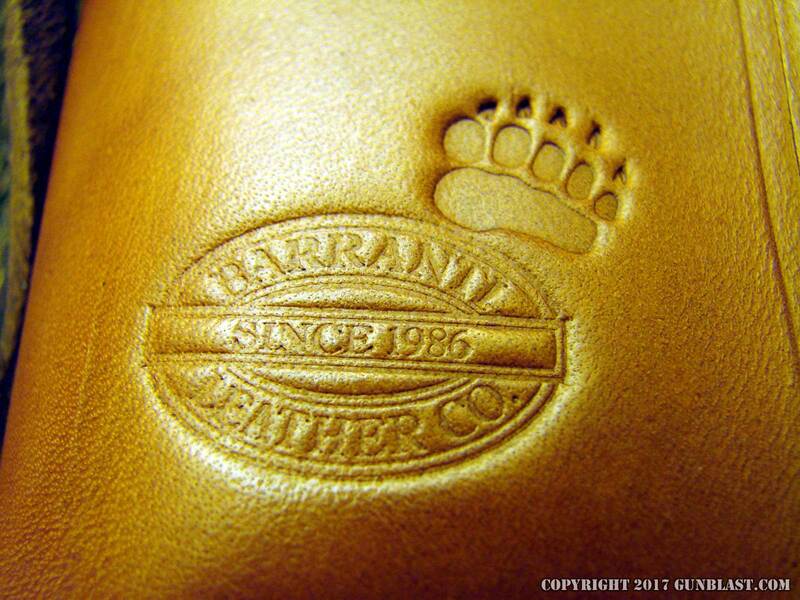 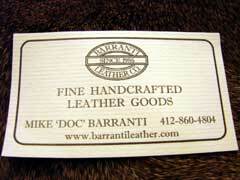 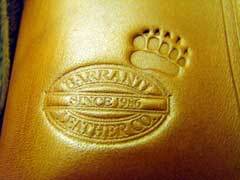 View Mike Barranti's leather artistry and order Barranti Leather at www.barrantileather.com. 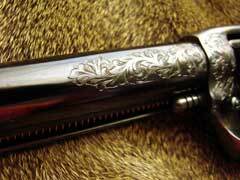 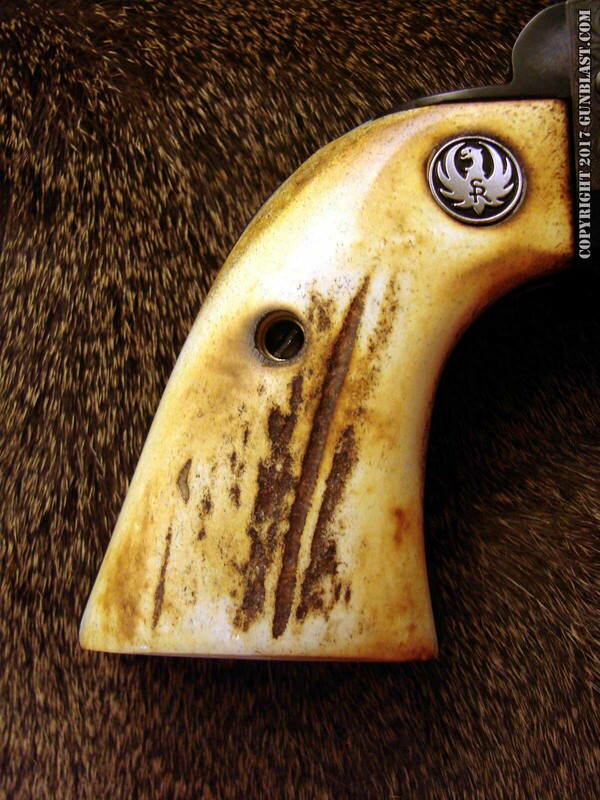 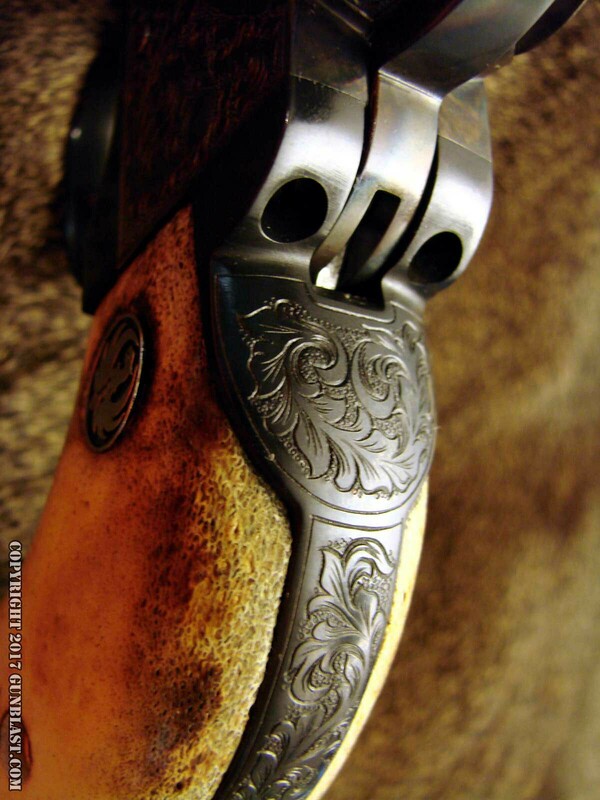 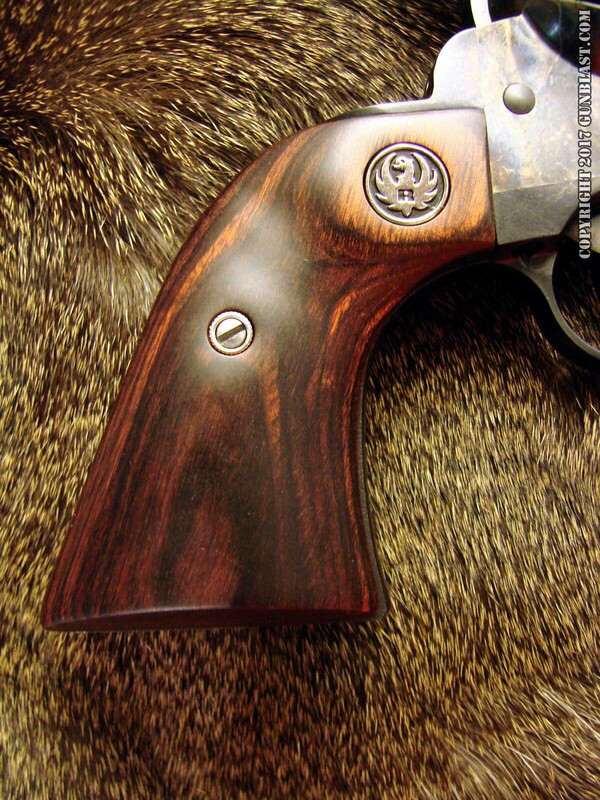 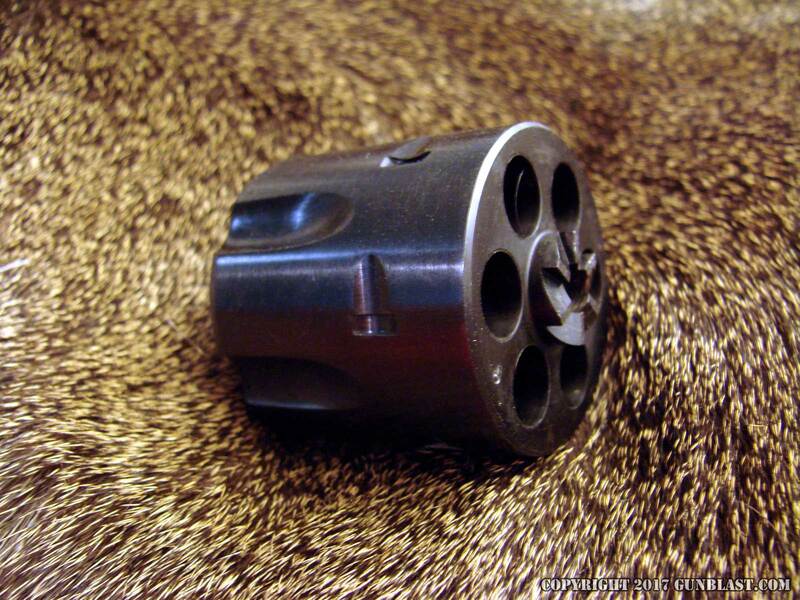 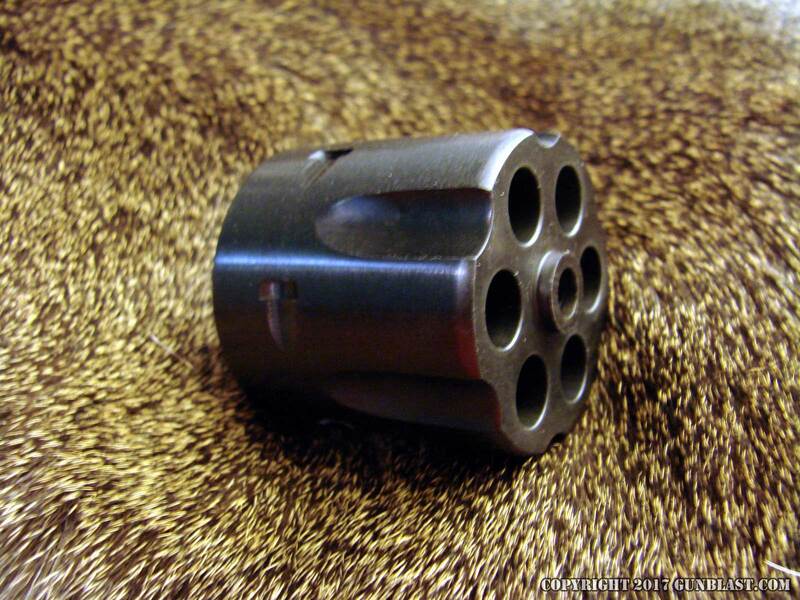 Hand-antiqued Stag grips are available as an option.